When it comes to your bathroom or kitchen remodeling, choosing the right countertop is an important issue that is likely to involve a big expense as well. Recycled countertops should definitely be considered as they can offer a less expensive alternative to other types of countertops. For instance, recycled glass countertops can be the perfect way to add extra beauty to your kitchen space without having to spend a fortune. 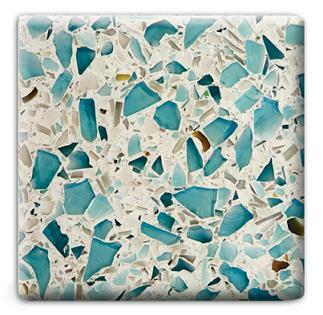 Recycled glass countertops are made of glass that offers a simmering and almost opaque look. They come in a wide range of colors and with internal waves or bubbles in their structure to add interest to your kitchen space. Also, recycled glass countertops can be made of concrete mixed with recycled glass in order to provide a look that is quite similar to a granite countertop. One of the best advantages brought by this type of recycled glass countertop is the fact that the concrete base can be shaded in order to provide a better match for the color scheme of your kitchen space. Also, you can go for a mixture that contains crushed glass, coal fly ash and recycled paper. All these materials are mixed with a low carbon percent that provides a quite strange mixture of colors and textures. Such a countertop will have the look of a limestone or soapstone countertop. One of the best benefits provided by recycled glass countertops is that no cleaning supplies or special sealing is required in their case. All you will have to do is to wash off your recycled glass countertop with water and soap. Recycled glass countertops are non-porous surfaces and you will not have to be concerned about bacteria building up on your recycled glass countertop surface. Unlike other countertops made from various materials such as marble, wood or granite, recycled glass countertops will not deplete any virgin natural resources. The glass used in the case of such recycled glass countertops comes from window glasses, bottles or broken stained glass. For instance, even traffic stop lights can be recycled in order to get a recycled glass countertop. So, recycled glass countertops are manufactured in order to become environmentally friendly and minimize the constant use of sealants and harsh chemical adhesives that can be quite harmful to human health on the long run. The versatility and suitability of recycled glass countertops make these surfaces a perfect choice for any modern kitchen space. Being less porous than marble countertops and as resistant and durable as granite countertops, recycled glass countertops come with increased heat resisting abilities and can be placed near an oven or stove. While providing a quite reliable working surface, recycled glass countertops require minimal maintenance that adds extra value to your recycled glass countertop. Wholesale Kitchen Cabinets & prices to match.